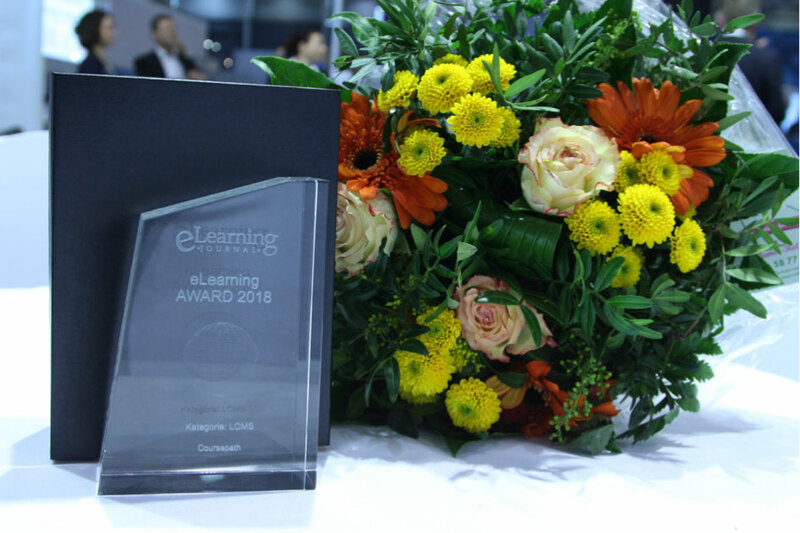 In the category LCMS the eLearning AWARD 2018 goes to Coursepath and BetterDoc. The joint e-learning project was awarded for its straightforward DIY approach. How the awarding came about and what companies can expect from it now. A Learning Management System (LMS), which is not only used for administration of members and courses but also for creation and revision of contents – that is what the eLearning Journal classifies as Learning Content Management System (LCMS). In this category, the journal presented Coursepath with the eLearning AWARD 2018. In a joint project with doctor recommendation service BetterDoc, Coursepath convinced the jury with the simple course creation within the platform. The chosen approach was Do-It-Yourself (DIY): Without professional help, only relying on the tool, BetterDoc started creating trainings around their own service. The goal was to qualify a customer’s employees for recommendation of the doctor recommendation service. The customer is the health insurance company AOK Hessen which is using the service with about 600 employees at 53 locations. For this purpose, BetterDoc employees mainly used PowerPoint presentations, which they converted within the LCMS and then enriched with simulations, quiz questions, and downloads. That resulted in e-learning courses that explain the BetterDoc service firsthand. Participants are immediately qualified for an accurate recommendation of the service. DIY course creation – how does it work? Coursepath Co-Founder and Managing Director Mujibor de Graaf is delighted with the awarding by the eLearning Journal: "The user-friendliness of our e-learning platform is our top priority. Therefore, we are particularly proud of the award in the LCMS category. This once again shows that our intuitive system is convincing, not only for our customers, but also for the expert jury. The Do-It-Yourself approach is gaining more and more popularity in the corporate world. We are confident that we can provide good support with self-explanatory software for independent course creation for many companies and organizations." He advises companies that want to take the training for their own products and processes into their own hands to try out the Do-It-Yourself approach to e-learning. "There is hardly any easier way than using a PowerPoint template – and in most cases that is already available. In addition to slides, BetterDoc especially supports their courses with yes or no questions. This is a simple but powerful means of checking knowledge directly in the course. Participants know what to expect and stay engaged with the learning content. Slightly more advanced are the simulations that BetterDoc uses. A nice method as well – but not absolutely necessary. A short video, such as a screencast, may already be enough to explain the product or process."